Practice Parenting – Anything worth doing is worth practicing! Authentic communication can change our culture! Be authentic and change your culture. I just don’t know if I can trust you anymore. Remember back when you told me everything? You can be authentic or you can be safe with me, what’s it gonna be? If you remember having those words with your adult (or nearly adult) child you recognize the need for SAFETY and AUTHENTICITY. We want our adult kids to trust us completely. We want them to tell us what they NEED and what they WANT. We don’t want to get the “published version” of a difficulty they are having or a struggle they are going through. We want them to feel safe telling us their stories. The ultimate goal in building the relationships with our adult children is for their benefit and the benefit of the culture we live in. Modeling authentic safety in relationships teaches those around us that the world CAN be a SAFE place! It is obvious that our world is bankrupt of trust. Integrity–doing what you say you will do–is not only in short supply, but often overlooked as a needless waste of time. If you shortcut, quit early, don’t deliver on a promise, few people will call you out. But you will know. Your kids will know. Your credibility with your adult children builds their trust in the WORLD…if you show integrity, then they can believe just a little longer and a little deeper. Do I believe building relationships with our Adult Children will change the world? Yes. With love, grace, and acceptance that comes through the power of the cross, I believe we can show the world what a loving Christian community can do. One family at time, we can become a loving Christian culture. So what is YOUR family story? I am not talking about a family mission statement (although that is nice!). I am asking about your STORY! What makes YOUR FAMILY totally unique from the rest of world? 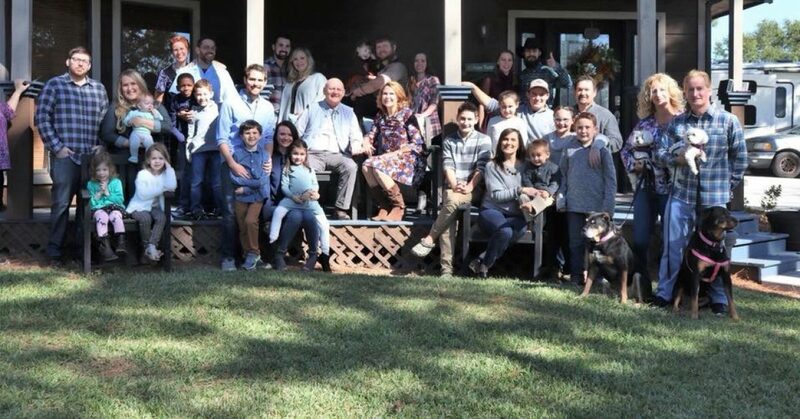 We have five adopted kids and a couple of adopted grandkids…but lots of people adopt. Our family almost died when Ted and I had only been married 10 years with two children… how about yours? Had a “near death” experience in your marriage? Ours wasn’t slowly dying. Ted and I were beating it to death. Then…God. This is a picture that NEVER would have happened if Ted had not stayed up all night praying for a resurrection of our dead marriage. Do your kids know of the struggles in your marriage? Do they know how HARD you have worked to build a family for them? They should! One of our girls became our daughter when she was handed to us through a car window. She now is the proud owner of our hearts. Where they began is important. Even if they have to overcome their origin, it gives them stability to know their roots. Do all your kids know their origin story? Do they know that you labored three days…or three years to get them here? Origin stories build their stability and security. Rehearse how they came into your family. When he was five years old, someone asked one of our sons what he wanted to be when he grew up. “A lion,” he replied. He wasn’t far off. As a former Marine, Scott has lots of “conquering hero stories worthy of a lion. Another son wore a hat emblazoned with bugs for a solid year. This “wild child” of a boy grew to be a teen who, along with two other friends, stopped a would-be street fight in Italy where we were traveling one year. That was precursor his job of ending the violence performed against women. The three brothers could not be more different. Their uniqueness BINDS them together. Do you let your grown-up kids know that the seeds of their greatness could be seen when they were young? Let them know you ALWAYS knew they would be AMAZING! The daughter that owns her Daddy’s heart came to us in a white pick up truck full of her worldly possessions when she was too young to drive that truck…but that is all the story I can tell you. She owns the rest of the narrative. One daughter didn’t speak to us for nearly seven years. Then a national disaster, the Boston Marathon bombing, brought us close. Jesus made us a family again. “Well, that was a wasted seven years,” Seth told us when we reunited! At six-years old, a son was almost hit by a car. Then the husband of the driver of the car came over and yelled at my husband for letting our kid ride his bike in the street in front of our house! Yes, for real. I can’t make this stuff up. Do your kids get to talk about “the hard stories?” Our family history is not all rainbows and unicorns. Some of our stories still make us cry. These are our family love stories. Keep making the family narrative! Telling your family stories to each other builds bridges that you can always cross to each other…and shows the world they can build those bridges too. What are your family stories? Can you share them with us? There are so many things I want to say…when is it right to speak? She once wanted my advice, now I feel shut out. What can I do? He wants to tell me all the dirty laundry about his wife and I am uncomfortable with that. What can I say? How do I start the HARD conversation? She is on the road she can’t return from. How can I tell her? She is grieving and I want to help…but how do I start? Setting boundaries concerning conversations must happen when your children become adults. When they were little we had hard and fast rules on words. “Mom, Scott called me stup-I-D, and told me to SHUT U-P, ” my five-year old Terah spelled out. NEVER would she say STUPID or SHUT UP! So, she had to spell the last few letters. Yep, words had impact. There were definitely off limit words. How about you? Could they say, “I hate you!” Where were the limits to what your kids could say when they were young? Do you still have limits on their speech now as adults? Are the boundaries spoken or unspoken? Avoiding hard conversations tells your adult child, “You don’t mean enough to me for me to be uncomfortable. My comfort is more important than your growth.” That is NOT the message we want to send. Start, and hang in there for, the conversations that MUST happen with your adult children. Schedule the hard conversations ahead of time if possible. Letting your child know that you are embarking on a topic that might be uncomfortable validates their thoughts, emotions, and experiences. Recently I had a concern about the health and development of one of our granddaughters. I told Nikki ahead of time I wanted to talk about her baby’s development. I listened as my granddaughter’s mom attempted to blow off what might or might not have been a health concern. “Can I say something about this or do you want me to mind my own business?” I asked. I suggested she take the baby to the doctor, which she did. Yep, I was dead wrong–nothing whatsoever was wrong with the baby. Am I sorry I stepped out ? Not at all. Because a few weeks later that conversation was the case-in-point in another conversation we were having. Nikki was talking about how hard it is to give or receive parenting advice. she knew I wouldn’t shy away from parenting advice just because I had over reacted before. “I know that if I was doing something wrong with my kids you would tell me! And I would listen,” she assured me. Once one of our adult kids and her significant other insinuated that we had lied about something. Drop the mic. Nope. Over the line. “Are you saying you think I lied to you? Because that wouldn’t be OK, ” my husband asked. Don’t be afraid to change the tone of the conversation. The worst boundary we can have with our adult children is an invisible boundary. Make sure the lines are clear. When one of your adult children steps over, don’t yell, become angry, or get offended. Simply restate the boundary in clear nonnegotiable terms. Always be the adult in the conversation. No matter how uncomfortable you become stay calm and keep ASKING QUESTIONS. Get crystal clear on what the challenge is and what your options are in the situation. A friend of mine asks her Adult Child, “Are you just venting or do you want us to work this out?” I like that. Our children DO need space to vent–but we do not have to be a whipping post taking body blows to fill their need. What ARE your clear boundaries in talking with your adult children? How have you communicated that you want to be open and honest–but not abused? Do you know what subjects are off limits in talking to your adult children? Have you approached your adult children with difficult topics? What has worked and what hasn’t? It is impossible to overstate the importance of developing good habits. In children, good habits develop their character. Parents of young kids work on teaching the habits of hygiene and good manners. But perhaps the most important habit we can teach our children is the habit of gratitude. Gratitude enlarges the brain and develops empathy for others. Gratitude reflects a heart of understanding towards others. Gratitude enlarges the number of friends one has—because grateful people are happy people. In his book The Happiness Advantage Shawn Achor recommends that folks keep a gratitude journal. Achor is one of more than a dozen authors who recommend this practice for keeping us on track with a grateful heart. Today book stores and office supply stores stock a variety of cute gratitude journals—but what other ways can we model gratitude for our kids and others in our lives? When my children were small one ‘game’ we played was a “go-around” in the car while everyone yelled one thing they were grateful for that day. We started the list with ‘A’ and tried to keep it going till we got to ‘Z’ and someone had to be grateful for the ever- present zebra. situations change and generally, with work, circumstances improve. When we first moved to Houston, Ted was pursuing a doctorate. Times were tight. Our daughter was going to public school which meant LUNCH MONEY!!! Naturally, before sending our first grader off to school we often had to play “find the change in the couch cushions.” Not only was this a great way to avoid negative thinking during that time but it taught her that there could be FUN in the hard times! A side benefit: now that she is a mom of six children, she has mastered that game with her own kiddos years later! Did we accomplish this grateful thinking 100% of the time— no. I lean toward the pessimistic side of the street while Ted resides permanently on the sunny side of life. Gratitude has its pay off! Why Do I Have to Practice Parenting? We practice law. We practice medicine. Who practices parenting? We practice law. We practice medicine. Shouldn’t we practice parenting? My poor husband was baffled. After 15 months of talking about reopening my blog to discuss the phenomenon of being the parent to ALL adult children he was sure I would have a better title that PRACTICE!! As a matter of fact, I am a pro. Dictionary.com defines a professional is someone who is engaged in a profession. (Don’t you love when the definition tells you nothing?) But the word profession is defined as an occupation, especially one that requires PROLONGED training! (Emphasis all mine!). I have been a parent over three decades and I have been ‘in training’ every day. Check that one! I am a pro! But the word practice is used to mean the carrying out or exercise of a profession. Of course you have most often heard this in the use of a law practice of the practice of medicine. Obviously we would all love to read a physician’s post after 35 years of treating the common cold on how to avoid the germs and make the illness pass more quickly, right? If an attorney who have been practicing a quarter of a century posts on how to draw up the unbreakable contract you would read that, right? Sure! So here I am: professional parent (because of the INTENSE and EXTENSIVE training) and I am putting out my shingle to say: Welcome to my practice! Lots of us think we are still in the business of practicing— like Little League baseball: show up every day from 3-5 and take a swing and a miss until you get it right. Hence, my tagline: everything worth doing is worth practicing. That should let the readier know: I am still swinging and missing at being a parent to adults…but I am willing for you to grab a seat and watch me swing. What I REALLY want from the readership is a lot of armchair coaches who can comment on how to better swing at how to celebrate your grown kids when they do something GREAT, like have a birthday! I hope to get coaching advice on posts about when to give advice to your kids and when to take the advice they are giving you. My goal is that PRACTICE PARENTING can be both a sounding board for when we royally mess this up and an advice column when we truly want and need help. Author Dr. Johnnie K. SeagoPosted on October 11, 2017 January 18, 2018 Format QuoteCategories UncategorizedLeave a comment on Why Do I Have to Practice Parenting? What Stories do the GrandKids Ask For? Grandson: Tell me a story about when my Daddy was a little boy. Granddaughter: Do you know funny stories about my mom, too? Me: No. I am your Dad’s mom. I didn’t know your mom when she was a little girl. But I wish I did. Grandson: Tell him about when Aunt Chelle got in trouble! Kids love stories. They especially love stories where they are the star! I love the books you order where you put your own child’s name in the story. Kids never tire of hearing their own history–real or imagined. Birthdays are good story material… the weirder the better! When my first grandson, Taylor was born, I wrote him a story every day for several months. He was always the hero conquering the dragon or saving a princess. For some reason I lost the book for a very long time. I may have hidden it because I was embarrassed at reading back over the sappy stories or thought my story telling would embarrass him in his later years. But, when he neared his sixteenth birthday, I found the book again. Now the stories still reeked of sappy, but they had a totally different effect: It was clear that the author was a grandmother TOTALLY in love with this baby. Over the MOON in love. For several months I wrote in Taylor’s unfinished book concerning the “Themes of Manhood.” I copied quotes, wrote anecdotes, and short stories of men saying and doing gallant deeds. These were real heroes, not imagined. At first he looked at the book and quizzed me about the content and intent. Then he hugged me and walked away. I thought that would be the last time I saw or heard of the book. Seated on the right holding his baby brother, Taylor, the first one who made me a Grandmommy. If you haven’t been around a 16 year old male lately, you might not realize the impact those few words can have on a sappy grandmother. When Taylor’s younger cousins or siblings spend the night the only part of the bedtime ritual they enjoy is the “bed-night” stories. I try to remember the most outrageous antics their parents performed or how much trouble an aunt or uncle got in. Since the grandkids parents all have seven siblings, there are PLENTY of stories. Tell me about the time Trace carried Tatum in a backpack! Kids love stories–especially if they (or their parents) are the hero. Tell them their story. You won’t be sorry. What stories do your kids love the best? Author Dr. Johnnie K. SeagoPosted on April 12, 2019 April 11, 2019 Categories UncategorizedLeave a comment on What Stories do the GrandKids Ask For? There is no way around it– I am the mom to EIGHT adult children. Even if I don’t count the sons-in-love and daughters-in-love that bless my life I have EIGHT adults who can go to a therapist and say, “It must be mother issues.” Yep. Guilty as charged. Our last two kids have done the college and marriage gig two and four years ago. We have had time to settle into our empty nest and make it feel like…home. Really, no kids. No loud music. No one asking for the car. Nobody needed us to pay tuition or buy books. No knocks on the door close to midnight, and this is OUR home. Do we really need this big house? Where should we move now that the kids are gone? What is our next career? Since we can afford a pay cut, what do we REALLY want to do for work? Which of the kids should we live near? Turns out, we really like our life. We like working for our faith-based non-profit organization. Ted likes working at a local church. I like writing, researching, speaking, volunteering, and even sweeping WAY too much floor for two people. And we like our kids. Don’t get me wrong: we have always loved them. We are parents. We had to love them even when they lied or came home after curfew. We had to love them even on the 100th time the girls wrecked the car. We had to love them in every country the boys tried to bring in some pocket knife, handcuffs, or toy gun and we got stopped by the airport security. We had to love them through stitches and surgeries. But we were NEVER required to LIKE them. That was our choice. It is still our choice–and it is SO MUCH easier to choose liking them today. They are eight wonderful, quirky, imperfect humans. They have chosen eight delightful, funny, imperfect life partners. They have (currently) given us 20 PERFECT grandchildren, to whom all blessings flow. On my bad days, I learn from and repent to my adult kids. They are smarter and holier than I am. On my good days, I do the same. I hope my younger self would be smart enough to listen. Who are the Parents of Adult Children? Who are Adult Children? He is 21. He doesn’t need a parent. He needs a friend! I told her when she was 13, I would always be her mother not her friend! That will never change! If I don’t give her advice who will? She needs me. She just doesn’t know it. He is my son. He has to listen to me! If he needs our help he will ask for it! Parenting adult children means … as many definitions as there are parents and adult children! Many of us want to grow alongside our children and become friends and trusted advisors. However, other middle-aged parents want their young adult children to prove their worth in the adult world before receiving the privileges of the adult world. Why are there so many different approaches to parenting the adult child? Obviously, because there exist many varied approaches to loving, living, communicating, and maintaining healthy relationships. No two families look alike–though many resemble each other. We can predict how parents will parent their adult children–but we can’t know for certain. The group of adults, now called Baby Boomers, are the parents of adults from Gen X, Millennial (sometimes called Gen Y) , and some Gen Z. Just as no one individual from any group maintain the same characteristic, we do know that Baby Boomers, as a group, are hard working, loyal, patriotic, and optimistic. THAT’S US! As the best educated group, Generation X (born 1966-1976) adult children show a desire to forge forward and try new ideas within a traditional family and work environment. As the first generation of “latchkey kids” they show a high dose of skepticism and isolation. Because the divorce of their parents negatively affected them, they tend to approach marriage and family with caution and educational logic. Millennial adults (born 1977-1994) desire more quality time with the ones they love, as well as time on their own. They will easily trade dollars in a paycheck for quality work environment or working for a cause they believe in. Many of the previous generations call this group lazy or unmotivated because they share different ideals than the other generations. Generation Z (born between 1995-2012) young adults include the most tech savvy of all previous generations. Never having grown up without the aid of a personal digital assistant, these young men and women will reach new heights of knowledge and diversity. The polarized political climate in America will enrage and discourage this ambitious group. Despite having been raised on positive feelings and leadership material, this generation will continue to climb the charts as the most depressed and anxious of all generations. What do all these labels and statistics mean: unlike previous generations, parents and adult children blur the lines of political involvement, social engagement, and business achievement. As men and women live and work longer, their lives and social calendars may include working and communicating with multi-layers of generational cultures. As the parents to these complex, educated, skeptical young people, we must make sure we know their generation, as well as our own children. We must learn the languages of their generations, not merely the language of our family. 1950s television shows like Leave it to Beaver showed a clear demarkation between the parents and the children. These lines have been steadily blurring since the 1960s and continue to blend together as our generations mix and mingle and desire ever increasing closeness in intimacy and frequency in communicating. It is up to us: Parents of Adult Children need to continue to build the unity and peace we profess to want in our homes, community, and culture. How will we meet that challenge with our adult children? Ideas about how you engage your adult children? How do you engage your aging parents from a generation gone by? What are the similarities and the differences? Author Dr. Johnnie K. SeagoPosted on March 1, 2019 February 28, 2019 Categories UncategorizedLeave a comment on Who are the Parents of Adult Children? Who are Adult Children?